After you have rinsed and sorted your beans add to a large chili pot. Pour in your water and add salt. Bring to a hard boil for 1 1/2 hours. Turn down heat to a simmer for 2 hours longer. Beans will be ready to eat. We like ours with a gravy like sauce but not mushy. Make sense? 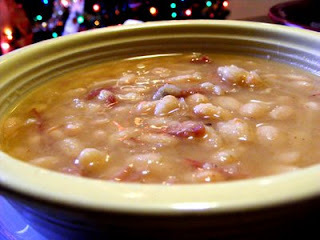 If you like your beans more soupy than thick add more water. We are having ours with fried potatoes and sweet cornbread. Give it a try.